Which census blocks or block groups intersect with one or a set of school attendance zones (SAZ)? 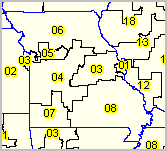 How to determine which counties are touched by a metropolitan area? Which are contained within a metropolitan area? Which pipelines having selected attributes pass through water in a designated geographic extent? This section reviews use of the ProximityOne Shp2Shp tool and methods to develop a geographic relationship file by relating any two separate otherwise unrelated shapefiles. Try it yourself ... see details below. As an example, use Shp2Shp to view/determine block groups intersecting with custom defined study/market/service area(s) ... the only practical method of obtaining these codes for demographic-economic analysis. 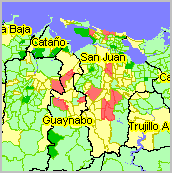 - the custom defined polygon was created using the CV XE GIS AddShapes tool. Many geodemographic analyses require knowing how geographic objects (points, lines, polygons) geospatially relate to others. 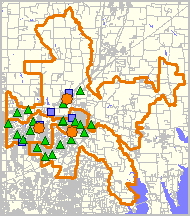 Examples include congressional/legislative redistricting (see census block/congressional district example below), sales/service territory management and school district attendance zones.  county(s) that touch (are adjacent to) a specified county.  block groups(s) that touch (are adjacent to) a specified block group.  census blocks corresponding to a specified school attendance zone.  attributes of block groups crossed by a delivery route. The following graphic illustrates the results of using the Shp2Shp tool to determine which block groups touch block group 48-85-030530-2 -- a block group located within McKinney, TX. Shp2Shp determines which block groups touch this block group, then selects/depicts (crosshatch pattern) these block groups in the corresponding GIS map view. In the process, Shp2Shp creates a geographic relationship file as illustrated below. There are six block groups touching the specified block group. As shown in the above view, one of these block groups touches only at one point. The table below (derived from the XLS file output by Shp2Shp) shows six rows corresponding to the six touching block groups. The table contains two columns; column one corresponds to the field GEOID from Layer 1 (the output field as specified in edit box 1.2 in above graphic) and column 2 corresponds to the field GEOID from Layer 2 (the output field as specified in edit box 2.2 in above graphic). The Layer 1 column has a constant value because a query was set (geoid='480850305302') as shown in edit box 1.3. in the above graphic. Any field in the layer dataset could have been chosen. The GEOID may be used more often for subsequent steps using the GRF and further described below. It is coincidental that both layers/shapefiles have the field named "GEOID". The following graphic shows the settings used to develop the map view shown above.  Shp2Shp operates on the GIS project in use. With CVXE running, start Shp2Shp from the main menu File>Tools>Shp2Shp. The above form appears.  Select the first layer using the 1.1. dropdown. This shows all available layers in the GIS project.  Select the field from layer 1 to be used in the GRF using the 1.2. dropdown.  Optionally set a filter/query to be applied to Layer 1 in the 1.3. edit box.  Select the second layer using the 2.1. dropdown. This shows all available layers in the GIS project.  Select the field from layer 2 to be used in the GRF using the 2.2. dropdown.  Optionally set a filter/query to be applied to Layer 2 in the 2.3. edit box.  Select the type of geographic relationship.  In the simplest situation, click the Find Matches button.  After grid displays, optionally click Export button to save the grid to the designated XLS file.  Repeat the process as desired. See more about the DE-9IM topological model used by Shp2Shp. .. not yet installed? Register for no fee installer (Windows).  Use the unmodified default start-up project c:\cvxe\1\cvgis.gis.  Start CV XE GIS.  Using Main Menu (top toolbar), select File>Tools>Shp2Shp. The start-up view of the form shown below appears. The following graphic shows the settings used to develop the map views shown below.  Select the first layer using the 1.1. dropdown as "CBSAs TX". .. this says to use only CBSA 19100 -- Dallas.  Select the field from layer 2 to be used in the GRF using the 2.2. dropdown as "Counties 1". .. do not set one at this time. The graphic shown below illustrates census blocks intersecting with Joyner Elementary School attendance zone located in Guilford County Schools, NC (see district profile). The attendance zone is shown with bold blue boundary. Joyner ES SAZ intersecting blocks are shown with black boundaries and labeled with Census 2010 total population (item P0010001 as described in table below graphic). Joyner ES is shown with red marker in lower right. The census blocks - school attendance zones were geospatially related using Shp2Shp. Geographic relationship files were developed separately for each type of zone (ES, MS, HS). 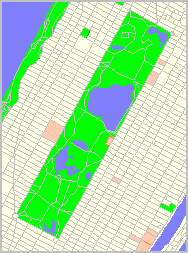 The school attendance zone geocodes were then integrated into the census block shapefile for each block in the district. Click the graphic below for a larger view. Expand browser to full window for best quality view. 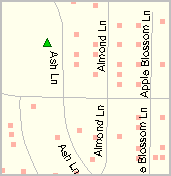 The larger view shows a mini-profile for the census block where Joyner ES is located. The mini profile shows attributes of this block included the relevant SAZ 1 (ES), SAZ 2 (MS) and SAZ3 (HS) codes. 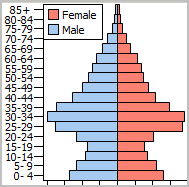 The mini profile also shows selected Census 2010 demographics obtained using the DEDE software. A next step would be to analyze characteristics of the attendance zone based on Census 2010 demographics. The selected demographic item field names/descriptions are shown below the graphic. Patterns of Hispanic population based on census block aggregated data. 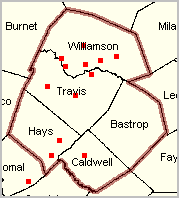 Red markers show school locations. See legend lower left; select your own measure, color, interval settings. Shp2Shp provides unique capabilities to determine/show/analyze data/geography visually and in tabular form -- determining census blocks comprising political geography such as cities, state legislative districts and congressional districts. The following example illustrates this process using North Carolina 115th Congressional Districts and Census 2010 census blocks using TIGER 2016 shapefiles. This process can be applied to any state/sub-state area. The following graphic shows North Carolina Congressional District 13 (CD 3713) with red boundary and cross-hatch pattern. 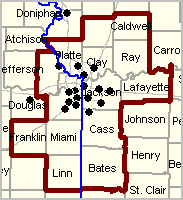 The CD intersects with five counties. The cross-hatch pattern is actually cross-hatching of census blocks contained within CD 3713. The cross-hatching was applied automatically (census block shapes selected) through use of the Shp2Shp tool. The map view shows census blocks determined to be within CD 3713 based on geospatially-determined geography. The blue cross-hatched area is Greensboro, NC. This illustrates how unrelated geography can be used for visual reference purposes. It could have been a state legislative district, census tract grouping or any other geographic area. See Shp2Shp operations section in next view. - view created using the CV XE GIS. The Shp2Shp operations form used to develop the above graphic is shown below. 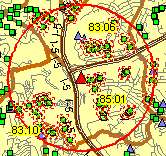 The controls reflect usage of "Find Matches - Contains" operations using the North Carolina CD 115 shapefile and North Carolina census blocks shapefile. A query is applied to the CD 115 shapefile to process only CD 3713. Without the query all North Carolina CDs would be processed. 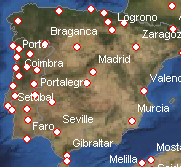 GEOIDs for the CDs and blocks selected/geospatially matched are shown for grid display. 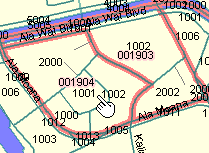 In addition, the census block Census 2010 total population (P0010001) is selected for display in column 3 of the grid. The grid footer shows the total number of blocks within the CD (20,432) and the sum of the block population (733,499). The process could be repeated selecting any Census 2010 block level subject matter item. 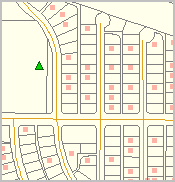 A query can also be applied to the census blocks shapefile (2.3. edit box), not used in this application. Optionally check the checkbox "Visible Extent Only" to restrict match processing to a visually determined subset of the CD (not used here). The matches data shown in the grid can be optionally exported to an Excel, CSV or dBase structured file -- a congressional district Block Equivalency File.